This thesis analyses the calculation of FanSave and PumpSave energy saving tools calculation. With these programs energy consumption of variable speed drive control for fans and pumps can be compared to other control methods. With FanSave centrifugal and axial fans can be examined and PumpSave deals with centrifugal pumps. By means of these programs also suitable frequency converter can be chosen from the ABB collection. Programs need as initial values information about the appliances like amount of flow and efficiencies. Operation time is important factor when calculating the energy consumption and information about it are the length and profile. ABB has developed calculation tools for estimating the energy savings that become available when applying electric speed control to certain flow machines. 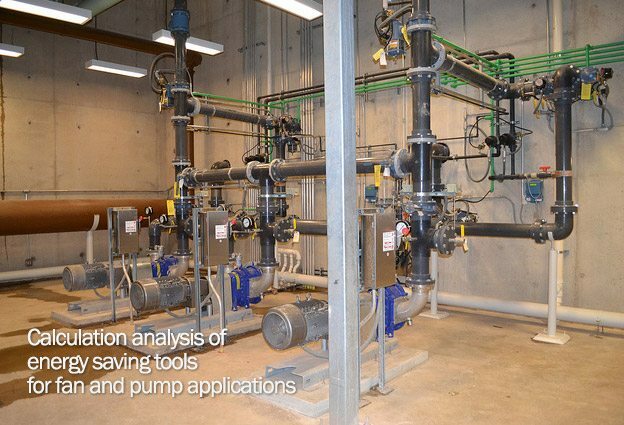 Using PumpSave and FanSave tools, AC drive control in pumps and fans can be compared against traditional flow control methods in terms of energy usage. The tools also provide financial figures for assessing the profitability of purchasing an ABB drive. PumpSave and FanSave run in Microsoft Excel and utilize VBA macros. PumpSave 5.1 Energy Saving Calculation Tool – for comparing AC drive control against throttling, on/off and hydraulic coupling control with pumps. Calculate how much energy and money you could be saving with ABB drives while also deriving other benefits such as soft starting and stopping, an improved power factor, and connection into process automation. FanSave 5.1 Energy Saving Calculation Tool – for comparing AC drive control against traditional flow control methods in fans. Calculate the savings you can achieve by replacing outlet damper, inlet vane or pitch control methods with electronic speed control from an ABB drive. FanSave also provides financial and environmental figures concerning the control method retrofit project and recommends a suitable ABB drive type. Fan is the most important part of a ventilation system. It is used to transfer air through ducts and spaces. Air movement is caused by a rotating impeller which is installed with blades. Fans are chosen by the purpose of use. Most important factors affecting the choice are the volume flow and pressure difference generated by the fan. Characteristic for an impeller of a fan which has forward curved blades is that the impeller is small-sized and has low rotational speed and noise level for certain pressure and volume flow. Pressure and power demand curve of a centrifugal fan with forward curved blades are illustrated in figure 1. At low flow rates the operation of fan is unstable this is shown in pressure curve which is descending at this operation area. Using fan in this operation area is not suitable but at the operation range where pressure curve is ascending. Instability of the system is shown also in the section angle of the system curve and the pressure curve which is small. Impeller which has backward curved blades it is characteristic to have high efficiency and higher noise level than an impeller with forward curved blades. When fan’s characteristic curve changes the volume flow doesn’t really change. Impeller with backward curved blades is suitable for cases where low running costs are demanded. Figure 2 illustrates pressure and power demand curves for a fan with backward curved blades. This type of fan is able to function at wide operation range. Fan with backward curved blades can reach the efficiency of 80 %. All credits for this master thesis goes to the author mr. Teemu Taskinen.